http://www.flickr.com/photos/zackw/sets/72157626242279049/ contains several photos taken on the seven-hour bus ride around the backside of the mountains, through Lillooet and Hope and Chilliwack. I don’t expect I’d ever have gone there otherwise. I was at that Summit as a volunteer, and John Lilly was the Mozilla CEO at that time. He would almost every day in the morning do a greeting of the whole group and go over logistics etc. of that day. So, one day we had some Mozillian doing an early morning run and spot a bear right in the village of Whistler, posting pictures of that bear online, and then the news broke that there was this rockslide on the road between Vancouver and Whistler. John Lilly came up on stage this day in the morning and was joking around in his fun way, giving us all that bad news in a really fun way. Same next day when we woke up to a power outage in the hotel (I even showered completely in the dark), with only our Mozilla wifi working as the IT guys reacted and hooked that up to emergency power, where John told us the story behind it – in the night, a laundry truck had backed up into the hotel’s transformer – and the way he told those things to us, everyone laughed about it. I never saw anyone delivering bad news in such a humorous way, it was hilarious, and it will always stay fondly in my memory. For those who missed the power transformer, http://www.flickr.com/photos/10904161@N00/tags/summit/ . 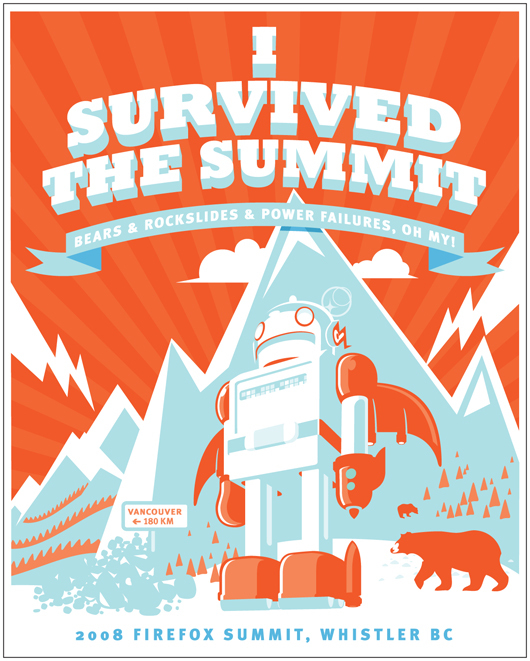 I broke the “bear” news right before the Summit started, on Planet Mozilla. I recall being all excited and being unable to sleep due to jet lag, and took a walk downstairs at about 5am. I just left the hotel when I spotted the bear, walking on all fours about a few feet away from me. Had to be careful to turn my camera flash off for I had a great Summit to attend. Tailed the bear from a safe distance who (luckily) seemed more interested in getting at trash cans / cupboards / other storage buildings than me. Of course, after that came the rockslide and the partial power outage. The 2010 Summit wasn’t as eventful – so everyone remembers the first one now. It was my first time at the other side of the Atlantic, the first time we met Mitchell Baker, John Lilly and other historical mozillians, no words can describe the emotion. I remember this too, watching as day after day, John would inform us of the next calamity that had befallen us. We put people that absolutely had to get back on sea planes, and the rest of us had to get in buses and we drove for 8 hours to get us back to Vancouver. I was supposed to be staying on in whistler for some days and hiking post-summit. But, the rockslide had me scared that if I didn’t leave on the big Mozilla bus I might not be getting out, so I took the bus back to Vancouver, and one of the Vancouver Mozillians let me stay in his house for a few days until my flight. It’s easy to be a community when things are going well. It’s how you handle difficulty that really shows what you’re made of. And this summit will always be my favorite. I actually joined Twitter the morning the power went out and I needed to know what the heck was going on (laundry truck?). Also: I feared taking a shower in the dark due to rogue bears. Good times. Good confusing times. As noted earlier, the other way out was float plane. Some of us elected to arrange for our own float planes rather than take the long bus ride. Thursday morning the final “calamity” (though, probably the least calamitous) struck as it was very foggy in the area and most float plans were unable to take off. So, several of us hopped in cabs and drove from lake to lake trying to find a float plane company that was operating. Bret and I found one, but only one seat left on their flights for the day. Since he had the earlier flight, he took that seat. Then my phone rang and it was Dan calling. They had secured an entire float plane, but it was taking off from a lake about 40 minutes south of our hotel. At the time I was at a lake north of the hotel. So I cabbed it back to the hotel and joined a larger group in a van cab heading to this fog-less lake essentially just north of the land slide. The plane ride was an experience in and of itself. Great views of the landslide and the countryside (though some of us on the plane weren’t enjoying the ride quite as much as other). We all got to Vancouver, but in the end most of us missed our flights, including Bret. We got a hotel, had a nice dinner and woke up early to catch our rebooked flights home. 1. Getting rollicking drunk the night before I was to deliver a workshop on User Experience in Firefox, and being called on my cellphone when I was 5 minutes late for said workshop because the power had gone off and the alarm had failed. Showered and got downstairs in 5 minutes flat, and was very happy that we were forced to have the workshop in the hallway (since the rooms lacked A/C and were very hot) which meant we all had to speak softly. It was very hangover friendly. Also: I learned to love the irascible Rob Sayre at that very workshop! 2. When John was up on stage talking about how the landslide had us all trapped, I quickly started researching float planes and making reservations for friends. This went to best use when Neil Deakin got a seat on a float plane, ensuring that he could make his flight back to the east coast … so he wouldn’t be late for his wedding. 3. The Globe and Mail, delivered to everyone’s door on the morning they were about to board buses for a 6 hour journey, featured a screaming headline detailing the gory decapitation murder of a man on a bus. Oh! So that’s why the workshop was in the hallway! I’ve been describing that particular gathering at Summit 2008 as an example of how engaged people got in topics back then as we work to plan this year’s massive undertaking of 3 summits, each similar in size to that year’s. The first intercontinental meeting of Mozilla Hispano?